Stephen Rex Brown A flyer alerting locals to the squirrel. New details have emerged about the orphaned baby squirrel that is reportedly approaching passersby in a desperate attempt to feed. 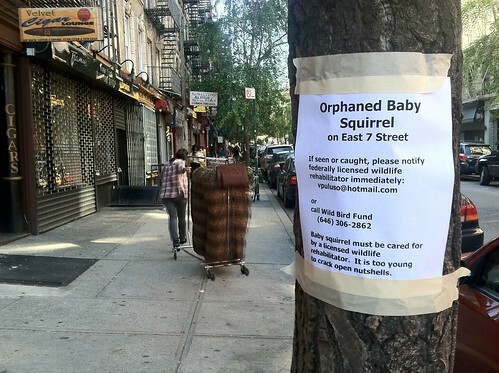 A woman who said she had posted the flyers alerting locals to the squirrel contacted The Local this morning and shared her saddening first encounter with the critter on Monday on East Seventh Street between Second and Third Avenues. “This precious little squirrel — literally the size of my hand — was looking at people beseechingly and trying to climb up their pant legs,” said the woman, who did not wish to give her name.